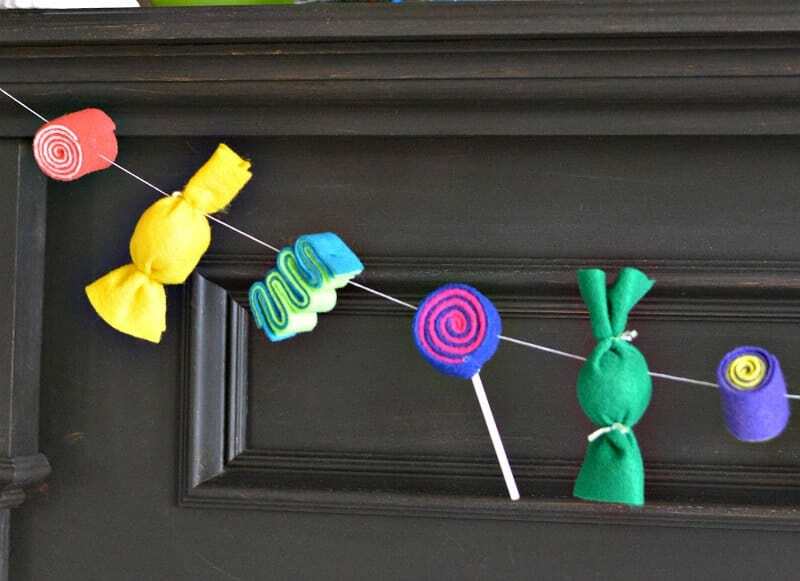 Make a candy garland out of felt for a colorful decoration for Christmas, birthdays or any sweet time! 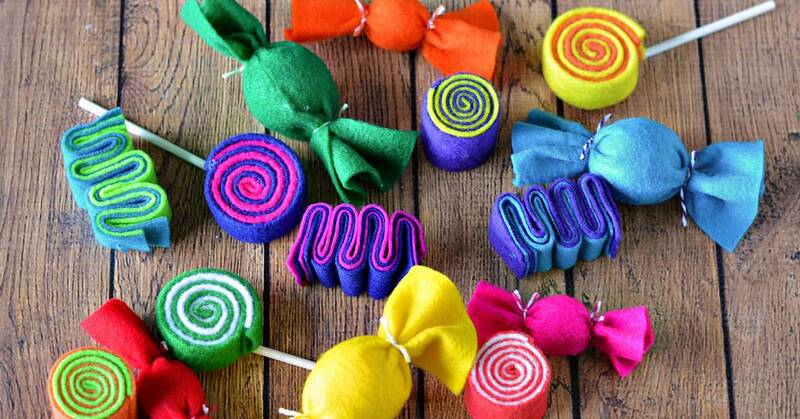 A few years ago I saw some felt candy ornaments floating around the internet and I fell in love with them. They looked fairly simple to make. But it seemed like a shame to keep them hidden all year and only bring them out for Christmas. So instead of ornaments, we have a candy garland! 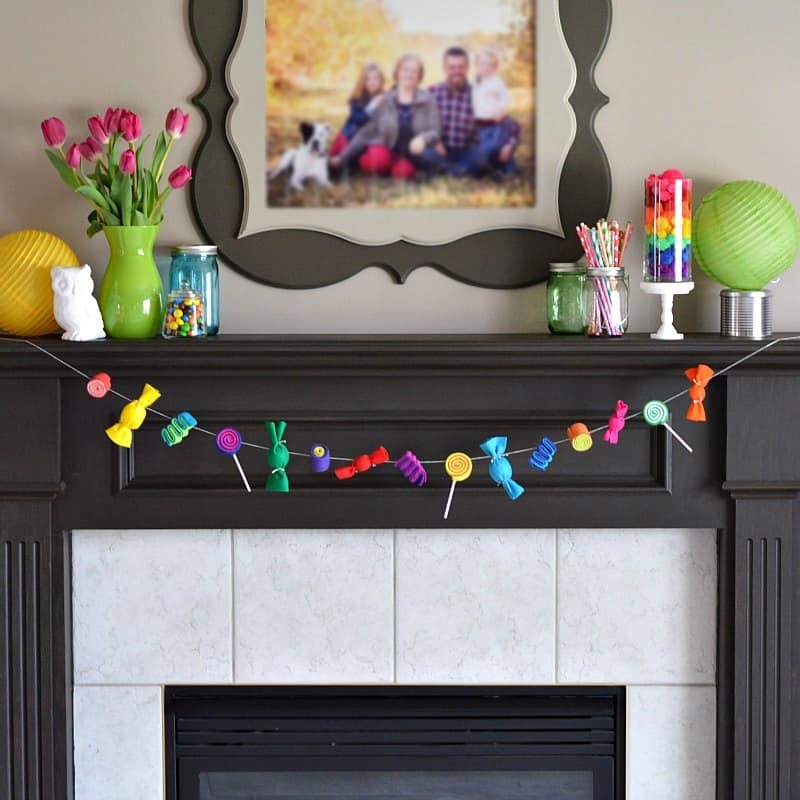 Hang the garland on your mantle, Christmas tree, a Candyland themed trunk or treat or just for a festive look around the house. 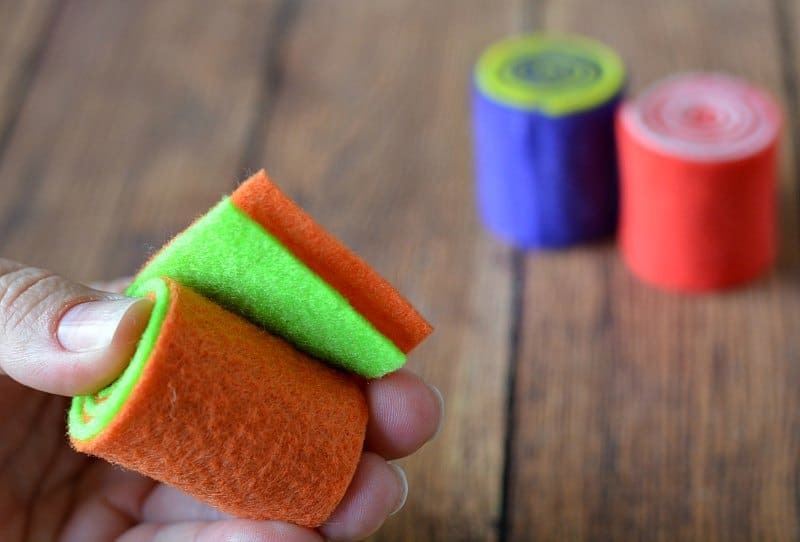 Use two different colors of felt and cut two of each color 9″ x 1″. You will need FOUR strips of felt. Thread your needle now with a coordinating embroider floss color and tie one end with a knot. Set aside. Stack all 4 pieces of felt on top of each other, alternating colors, and fold it back and forth in an accordion fold. 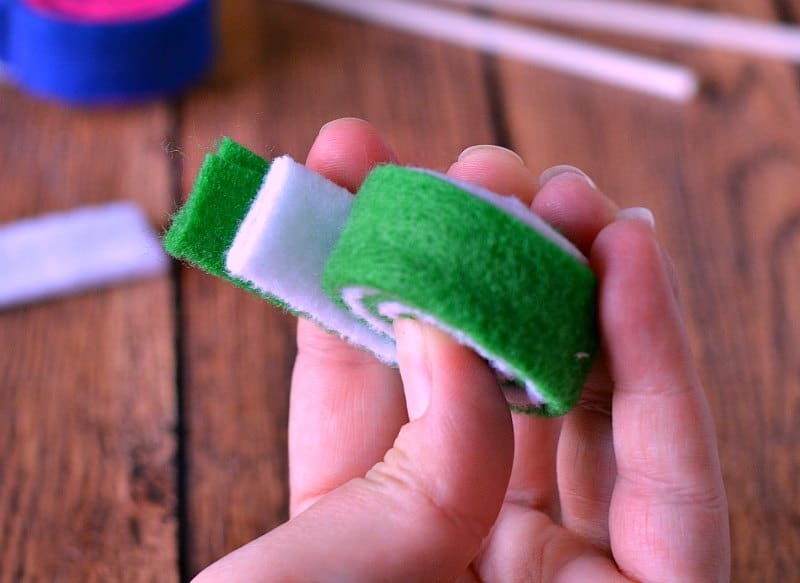 Hold together with your thumb and index finger and thread the needle into the center of the felt. Pull tightly and knot on the other end. Trim excess thread. 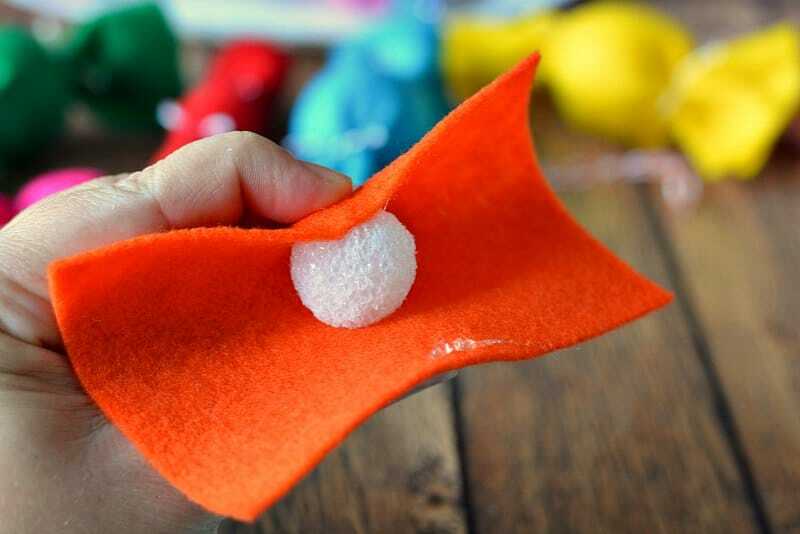 Use a 1″ styrofoam ball and cut a piece of felt to 4.25″ x 3.5″. 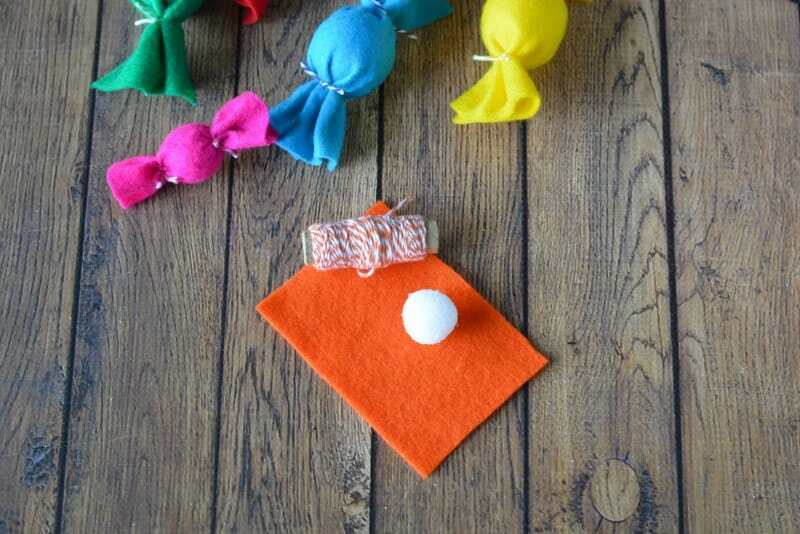 Place the foam ball on the center of the felt and wrap around the ball, affixing with hot glue in the center. Cut two small pieces of baker's twine and tie the ends tightly to form a candy. To make larger pieces of candy use a 1.5″ styrofoam ball and cut a piece of felt to 5.5″ x 4.5″. 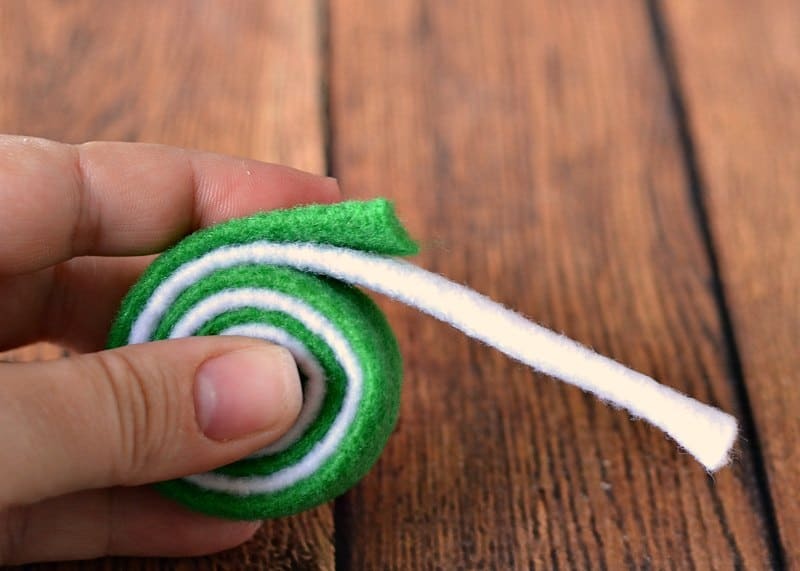 Place the foam ball on the center of the felt and wrap around the ball, affixing with hot glue in the center. Cut two small pieces of baker's twine and tie the ends tightly to form a candy. Select two different colors of felt (such as red and white) and cut them each to 1.5″ x 12″ in length. 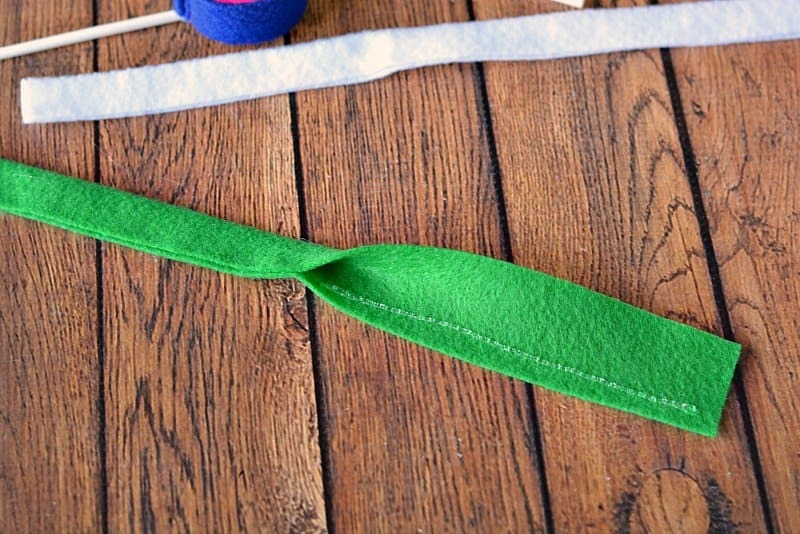 Place the two pieces of felt on top of each other and offset them a bit as shown. 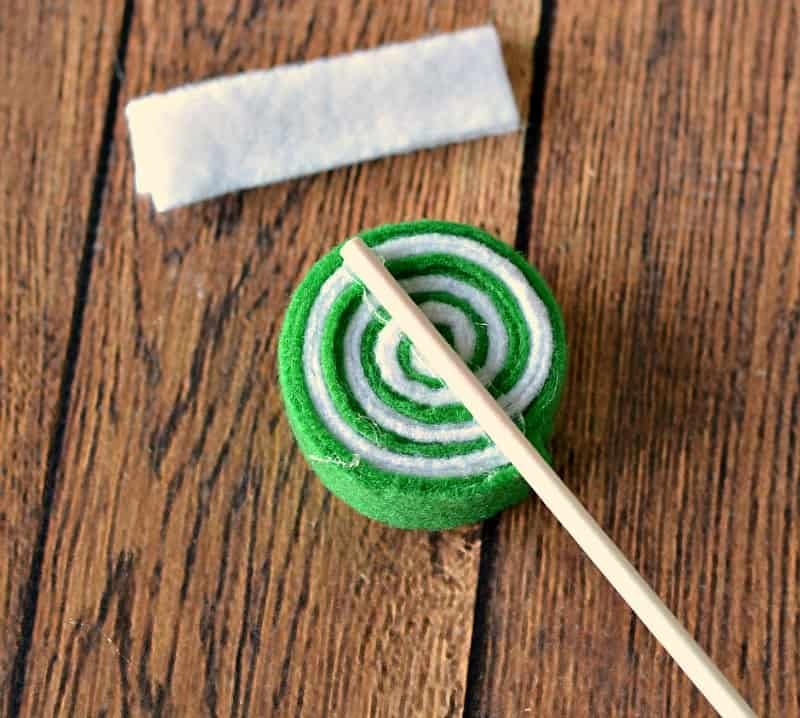 Roll the candy tightly, adding a little hot glue in the center as you begin to roll. Trim off the excess and affix with hot glue to seal. Select two different colors of felt. Cut each piece to 1.25″ x 12″. Fold each piece in half and glue on the open edge with hot glue (so you have a 5/8″ x 12″ piece). 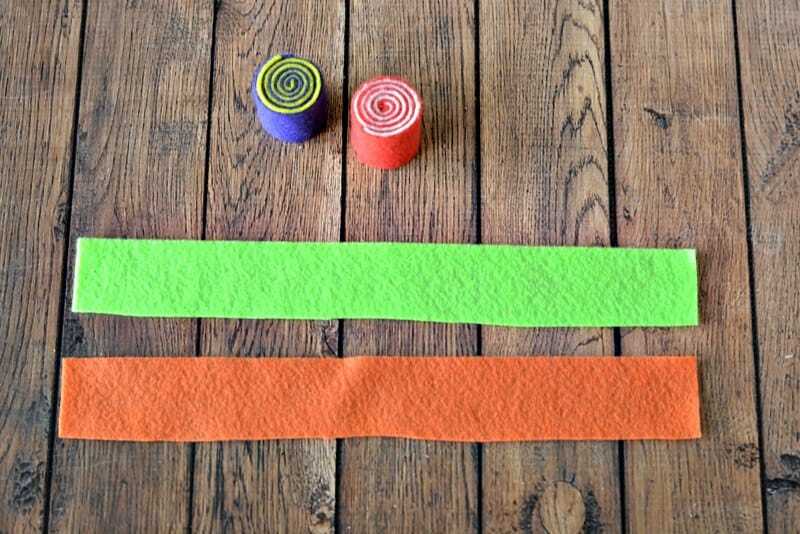 Stack the two pieces together and offset one color and roll it tightly. 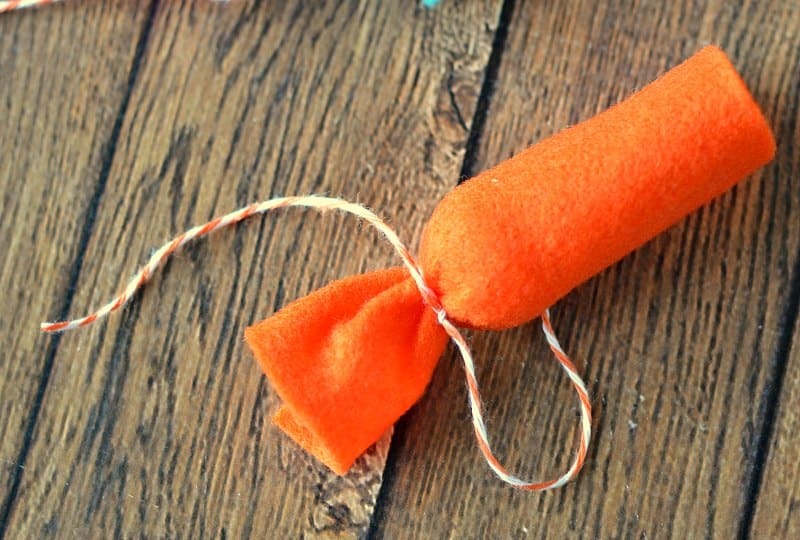 You may want to add some hot glue as you begin to roll it up. Trim the excess/over hang and affix the end with hot glue to seal. Add a lollipop stick to the back of the lollipop with hot glue. Use white (or any color) embroidery floss and measure the area you'd like to to hang the garland. Add about 8″ to each end. 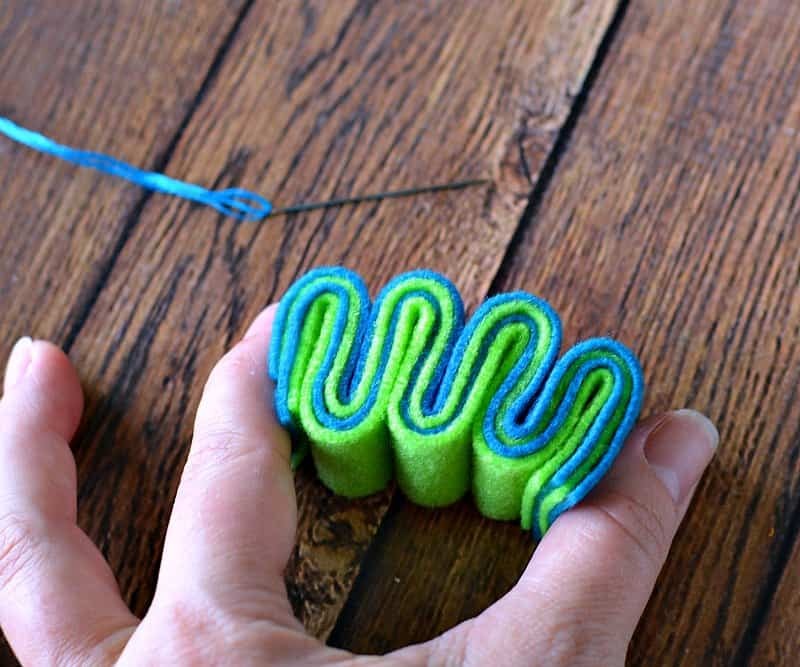 Divide the embroidery floss by removing three strands. 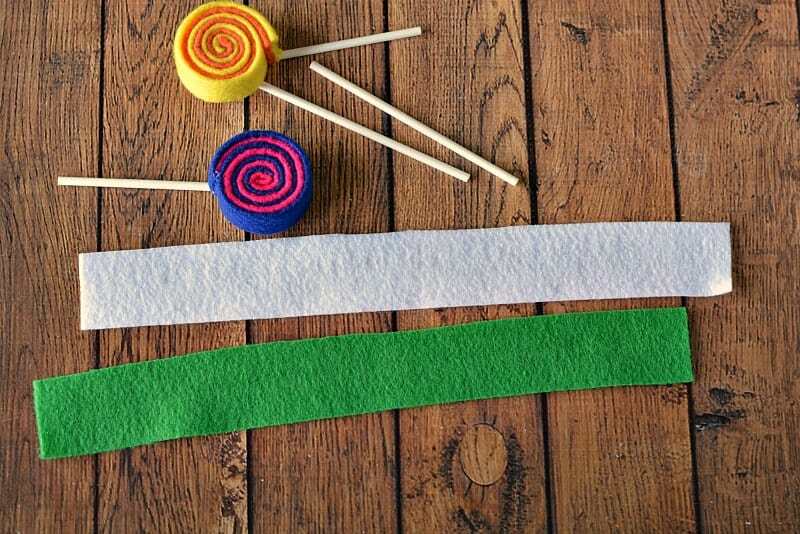 Thread each piece of candy onto the floss with the needle. 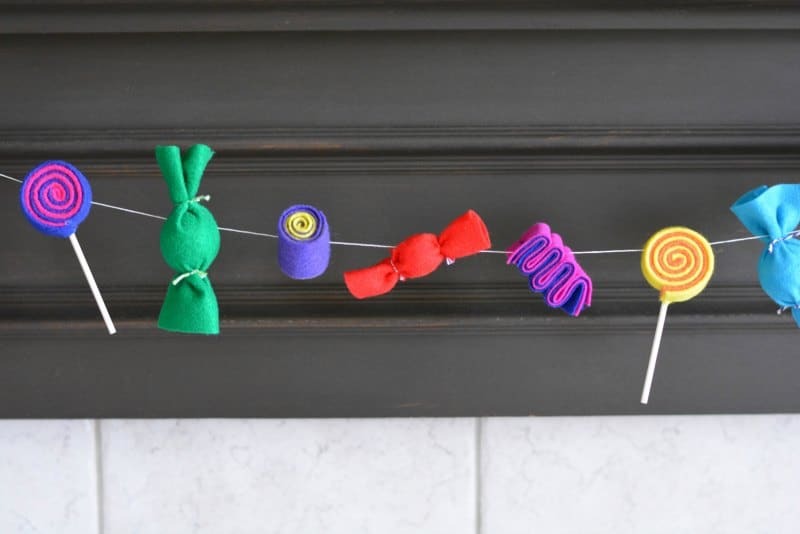 Hang the garland and then slide the candy apart (along the thread) to evenly space it. Enjoy all year long! These are SO cute!! Perfect for a kids party! The only problem I’ll have is to try and stop my two-year-old from eating them!! This is so cute! Just yesterday I was telling my husband how much I would love to live somewhere with a fireplace and mantel to decorate. It would be so much fun to have a mantle to string garland on! So festive and fun! I would love to make them for my classroom windows. This is an adorable idea!! I love how fun and colorful it looks. This would be perfect for an all-sweets themed tree! Thanks for sharing with us on the Family Joy Blog Link Party! This is SUCH an adorable idea. Love that you can really use it for any occassion! Thank you for sharing at Merry Monday! 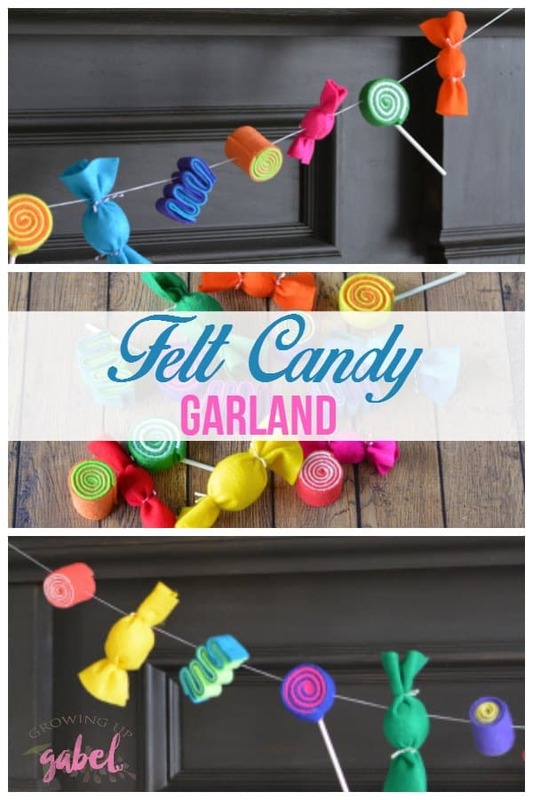 What a cute fun garland, and so kid friendly! Thanks for sharing at Dishing It & Digging It! that is aDORable. the ribbon candy! omg.